Andreas Boecherer is at the 80-km-mark: Domenico Passuello is about 2:50 behind and in third - 100 meters behind Boris Stein and 50 meters ahead of Joe Gambles. Gambles is followed by Jan van Berkel, Michi Weiss and Sylvain Sudrie. 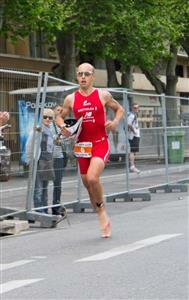 Make ready, Aix-en-Provence: Andreas Boecherer is making his way to T2. 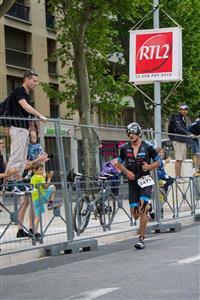 Andreas Boecherer is off the bike in 2:38:20. 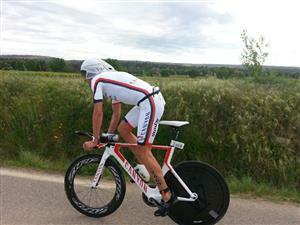 Andreas Boecherers bike split: 2:12:21. Michi Weiss had the fastest bike split: 2:12:15. 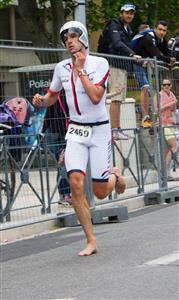 He was 6 seconds faster than Andreas Boecherer, Boris Stein managed a 2:12:41. 10 more km on the bike for Camilla Pedersen. Thanks to a super fast split Ritchie Nicholls has made his way into Top 10 again. He is in 8th now (+5:53). Waiting for Camilla Pedersen in T2. Camilla Pedersen is off the bike. Her lead is 3:30 over Gabriella Zelinka. 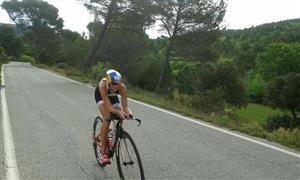 Camilla Pedersen's bike split: 2:34:48. The run course is 4-loop-course. The boys are on the 2nd loop now while the pro women start into the half marathon now. Ritchie Nicholls and Michi Weiss are the fastest runners so far today. 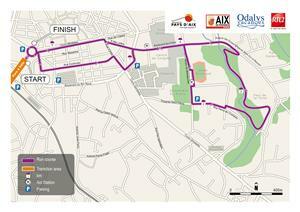 Nicholls managed the first 7.8 km in 26:55 minutes, Weiss in 27:34. They are really flying out on the course. Half time for Andreas Boecherer. He is at the 10.6 km mark. Race time: 3:18:36. Boris Stein is 1:59 behind. Michi Weiss is at 2:31. Something happened to Camilla Pedersen. We try to find out if she had a penalty or a technical issue. She is in second now - 1:59 behind Gabriella Zelinka through Km 2.5 of the run. Camilla Pedersen on the bike. Andreas Boecherer starting his run. Boris Stein - in second place after the bike. Michi Weiss making his way onto the podium today? Boris Stein on the bike. Ritchie Nicholls' run split for the first 10.6: 36:20. We hear that Camilla Pedersen got a penalty - that's why she lost so much time in T2. This race will get really close on the final 5 k. Boris Stein is 1:12 behind Andreas Boecherer through Km 15.9. Jan van Berkel is at 2:14. Alexandra Tondeur is in second in the women's race - she has passed Camilla Pedersen at Km 7. Ritchie Nicholls is about to pass Domenico Passuello. Will he make it onto the podium? Update women Km 7.8: Zelinka, Tondeur (+1:44), Pedersen (+2:08), Mullan (+5:17). Close, close, close: Boris Stein is 46 seconds behind leader Andi Boecherer through Km 18.4. 1 kilometer to go for Andi Boecherer - but Boris Stein is almost in his neck. The gap is about 150 meters.